Lock in a great price for Studio City Hotel – rated 8.7 by recent guests! Breakfast, Afternoon Tea and Cocktail Package is worth the money. I thank F.O Hannah for being helpful through out the stay of my relatives. It’s a beautiful hotel and with very warm staff especially Panfilo from front desk. Who helped us get an upgraded room. Clean, super nice service, kids friendly hotel. We loved Complimentary chocolate and lip balm. Everything was grand and great. the vuew in the room was so nice. Shuttle bus service was great and with many routes options. Room service is nice. Everything is a phone call away. Bed is very comfy! Breakfast buffet have variety of food choices. Price is just right. I choose this property to enjoy the water park as advertised about their facilities but we weren’t able to try it coz of the typhoon, not even take photo at the place. Studio City Hotel This rating is a reflection of how the property compares to the industry standard when it comes to price, facilities and services available. It's based on a self-evaluation by the property. Use this rating to help choose your stay! 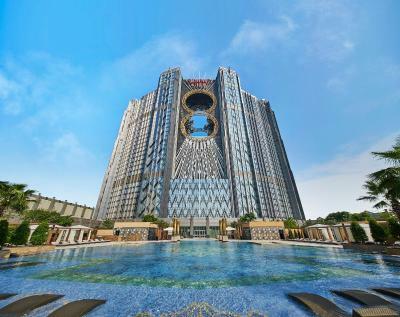 Offering a seasonal outdoor pool and various entertainment facilities, Studio City Hotel is located in Macau, a 5-minute drive from The House of Dancing Water. 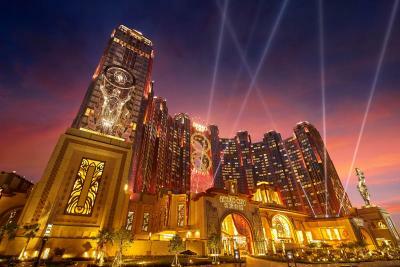 There is a water park and a casino on site and guests can enjoy the on-site restaurants. Free WiFi is featured and free private parking is available on site. 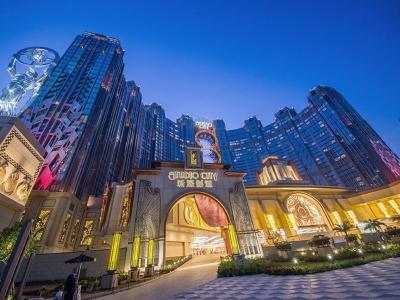 Studio City Hotel is around a 6-minute drive from Museum of Taipa and Coloane History, while Macau Tower Convention & Entertainment Center is around a 10-minute car journey away. Macau Airport is approximately an 8-minute drive from the property. Featuring garden and pool views, all rooms and suites are coming with a flat-screen TV with satellite channels, a mini-bar and in-room safe. Certain units include a seating area with a comfortable sofa. The private bathroom comes with shower facilities or a bathtub. 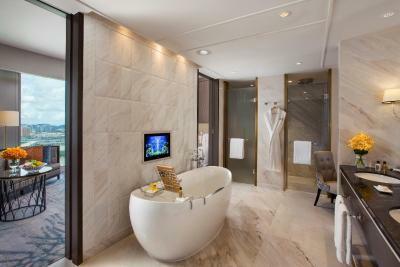 For guests' comfort, towels, bathrobes, bathing amenities, slippers and hairdryer are provided. 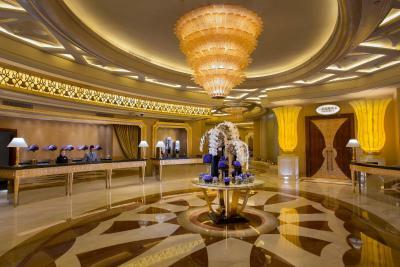 The 24-hour front desk and concierge counter offer premium services to all guests. Ticketing service, tourist information, luggage storage are all provided. 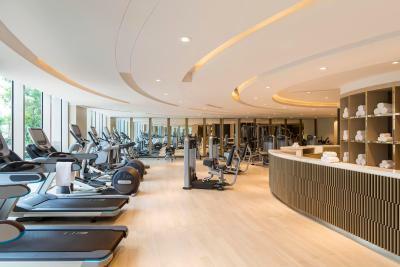 Guests can also exercise at the fitness center or unwind at the spa center. Banquet halls and conference rooms with modern audiovisual equipment are well-prepared to fit small to large-sized meetings, training or wedding receptions. 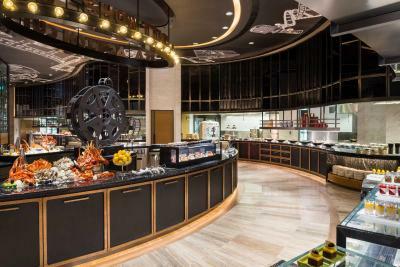 Spotlight serves a variety of international dishes in buffet style. 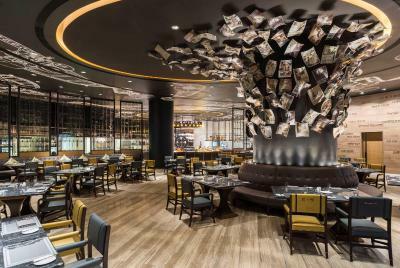 Other dining options include Cantonese cuisines at Pearl Dragon, Italian food at Rossi Trattoria and Japanese delicacies at Hide Yamamoto. When would you like to stay at Studio City Hotel? 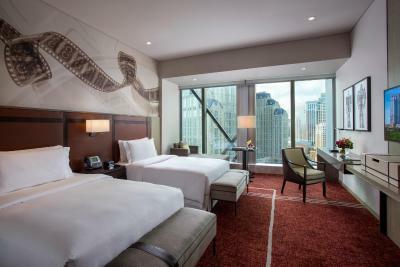 Located in Star Tower, the spacious suite provides guests with a comfortable king-size bed with down feather duvet and pillows. Variety of premium amenities includes a 55-inch flat-screen TV, mini-bar, coffee machine, separate bathtub and a walk-in shower. A roll-away bed can be arranged for the third adult guest upon request. 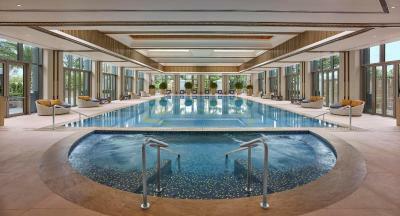 Star Tower guests have exclusive access to the hotel indoor heated pool. Located in Star Tower, the spacious suite provides guests with 2 comfortable queen-size bed with down feather duvet and pillows. Variety of premium amenities includes a 55-inch flat-screen TV, mini-bar, coffee machine, separate bathtub and a walk-in shower. 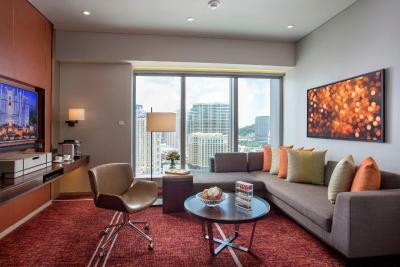 Located in Star Tower, the suite consists of a well-appointed bedroom and separate living area with extra space to spread out. 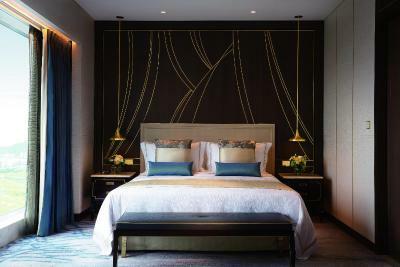 Completed with a luxurious king-size bed, the suite includes a high-quality line, down feather duvet and pillows. 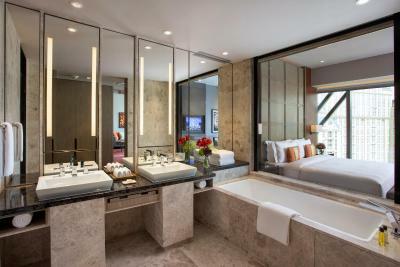 The number of premium amenities and services include a dining room up to 6 guests, a dressing alcove, a 55-inch flat-screen TV, a mini-bar, a branded coffee machine and a built-in TV in the bathroom. A separate bathtub and a walk-in shower are also provided. 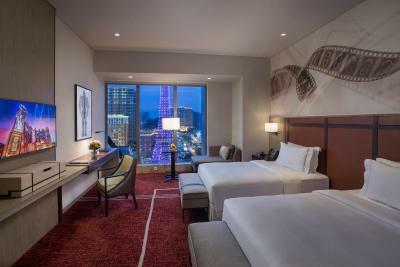 Located in Celebrity Tower, facing Cotai Strip, this modern guest room offers sweeping views of the enchanting strip through floor-to-ceiling windows. 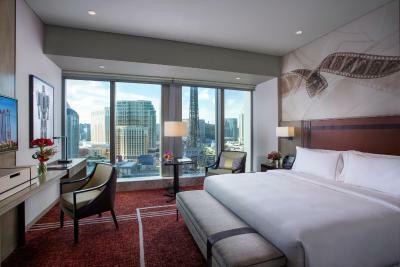 It comes with a luxurious king-size bed, 300-thread count linen, down feather duvet and pillows. Other premium amenities include a 42-inch flat-screen TV, mini-bar and an attached bathroom with a shower. - Surcharge of triple occupancy applies. This surcharge applies to hotel stay only and does not cover any other package benefits like show tickets, dining or spa services etc. 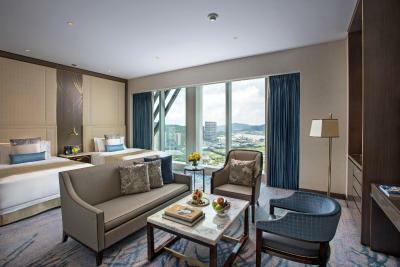 Located in Celebrity Tower, facing Cotai Strip, this modern guest room offers sweeping views of the enchanting strip through floor-to-ceiling windows. It comes with 2 luxurious double beds, 300-thread count linen, down feather duvet and pillows. Other premium amenities include a 42-inch flat-screen TV, mini-bar and an attached bathroom with a shower. 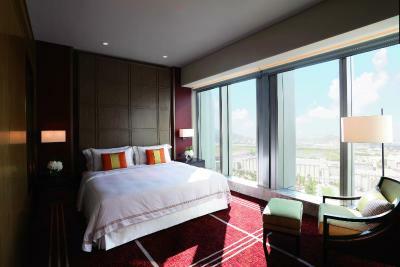 Located in Celebrity Tower, this room comes with a luxurious king-size bed, 300-thread count linen. down feather duvet and pillows. A variety of premium amenities include a 42-inch flat-screen TV, mini-bar and tea/coffee making facilities. 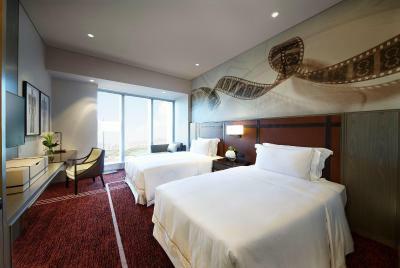 Located in Celebrity Tower, this room comes with 2 luxurious double beds, 300-thread count linen. down feather duvet and pillows. A variety of premium amenities include a 42-inch flat-screen TV, mini-bar and tea/coffee making facilities. Located in Celebrity Tower, boasting fascinating views and a unique experience without compromising on space, suite comes with a luxurious king-size bed with 600-thread count linen, down feather duvet and pillows, and a vast array of premium amenities include a 55-inch flat-screen TV, a Blu-ray DVD player, a built-in TV in the bathroom, a mini-bar and a branded coffee machine. The large bathroom is fitted with a separate bathtub and a walk-in shower. 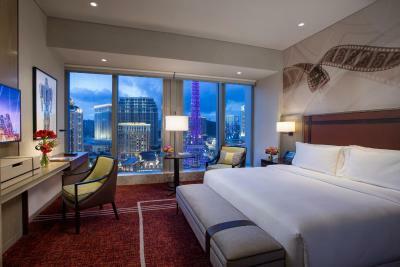 Located in Celebrity Tower, directly facing Cotai Strip, this room offers full panoramic views through its floor-to-ceiling windows. 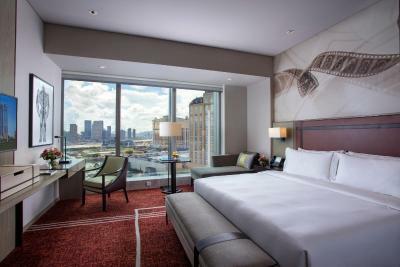 It comes with a luxurious king-size bed, 300-thread count linen and down feather duvet and pillows. 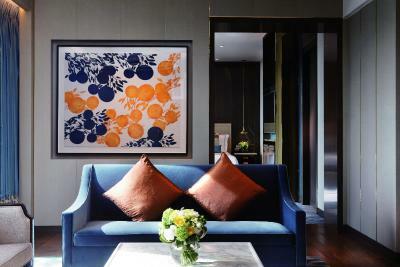 Other premium amenities include a 42-inch flat-screen TV, a mini-bar and tea/coffee making facilities. Please kindly note, there is no bathtub in this room type. 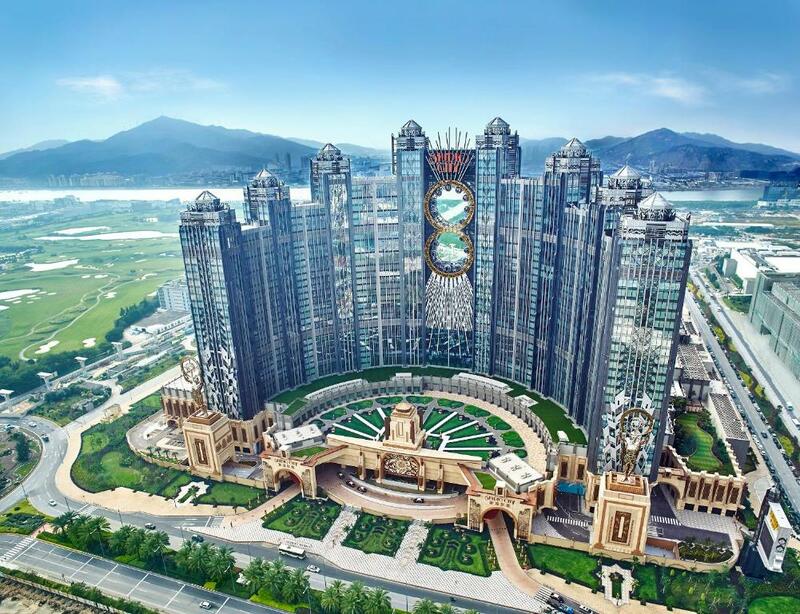 Located in Celebrity Tower, directly facing Cotai Strip, this room offers full panoramic views through its floor-to-ceiling windows. It comes with 2 luxurious double beds, 300-thread count linen and down feather duvet and pillows. Other premium amenities include a 42-inch flat-screen TV, a mini-bar and tea/coffee making facilities. - HKD 100 "Stay & Play" voucher. - MOP 100 entertainment voucher. 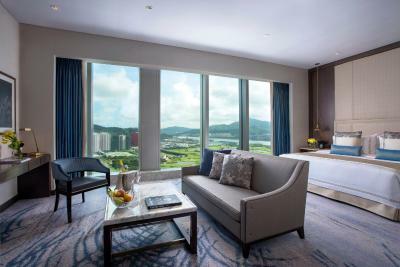 Located in Celebrity Tower, facing Cotai Strip, this modern guest room offers sweeping views of the enchanting strip through floor-to-ceiling windows. 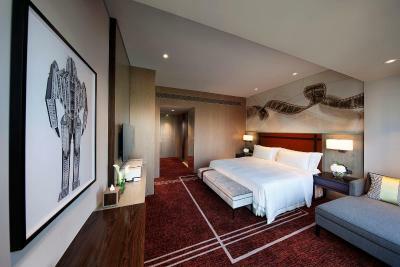 It comes with a luxurious king-size bed, 300-thread count linen, down feather duvet and pillows. Other premium amenities include a 42-inch flat-screen TV, a mini-bar and an attached bathroom with a shower. 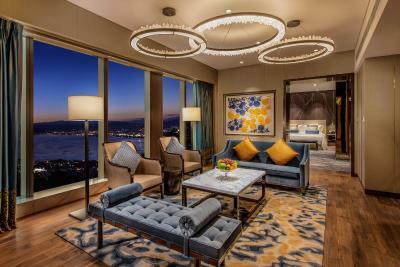 Located in Celebrity Tower, facing Cotai Strip, this modern guest room offers sweeping views of the enchanting strip through floor-to-ceiling windows. It comes with 2 luxurious double beds, 300-thread count linen, down feather duvet and pillows. Other premium amenities include a 42-inch flat-screen TV, a mini-bar and an attached bathroom with a shower. House Rules Studio City Hotel takes special requests – add in the next step! Any additional children or adults are charged HKD 575 per night for extra beds. Studio City Hotel accepts these cards and reserves the right to temporarily hold an amount prior to arrival. Both indoor and outdoor pool were great! 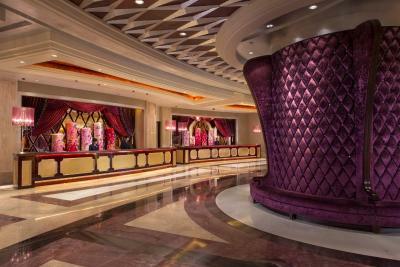 Great check in experience for Star Tower guests. Clean and comfy, friendly staff. The aircon had a musty smell when it defaulted to auto and reached the desired temp, so best to keep the aircon on manual mode at 23.5deg. Also food court is adequate for a quick bite but no comparison to range and size of Venetian, sands, or galaxy. The service was impeccable, friendly, helpful and genuinely understanding. Rooms were clean and the service is 6 star. Service desk Jayzel was truly one of the best hotel staff I’ve ever met. She clearly understood what it was like to travel with a younger toddler. We couldn’t have asked for more. At the time, there were major roadworks being carried out which caused some noise. Check in took quite long. I booked for non-smoking room but the staff provide me smoking room , they said it’s already non-smoking but the room is full of smoking smell.